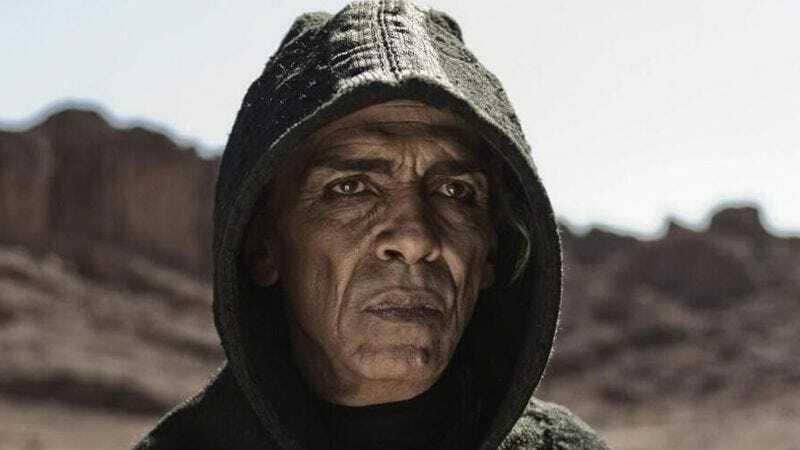 Concerned that a Christian message was being co-opted by a hateful right-wing faction just this one time, the producers of God’s only begotten miniseries The Bible have exorcised Satan from their upcoming Son Of God, after some said that the devil is President Obama—and also that the guy who plays Satan in the movie looks like him. Producers and married couple Mark Burnett and Roma Downey say they have completely cut the character from their upcoming movie, which streamlines the 10-hour miniseries into just the two hours of Jesus being born to a virgin mother, working miracles, and dying for the world’s sins that are interesting. “Someone made a comment that the actor who played the devil vaguely resembled our president, and suddenly the media went nuts,” Downey said of the time someone named Glenn Beck, using his most sophisticated flowchart yet, drew a connection between actor Mohamen Mehdi Ouazanni’s face and Obama’s, and then the media seized on this rare occasion of Glenn Beck suggesting Obama was the source of all human misery. This time around, Downey says she “wanted all of the focus to be on Jesus. I want his name to be on the lips of everyone who sees this movie, so we cast Satan out.” Of course, a Jesus movie without Satan is like Smokey without The Bandit; their antagonistic, will-they-or-won’t-they-curse-all-of-mankind-to-eternal-darkness relationship is the heart of the story, and it’s hard to imagine one without the other. (For one thing, Jesus’ 40 days in the desert will now look an awful lot like a power cleanse.) Still, such are the steps the producers must take to ensure followers of Jesus will only ever be about the love.